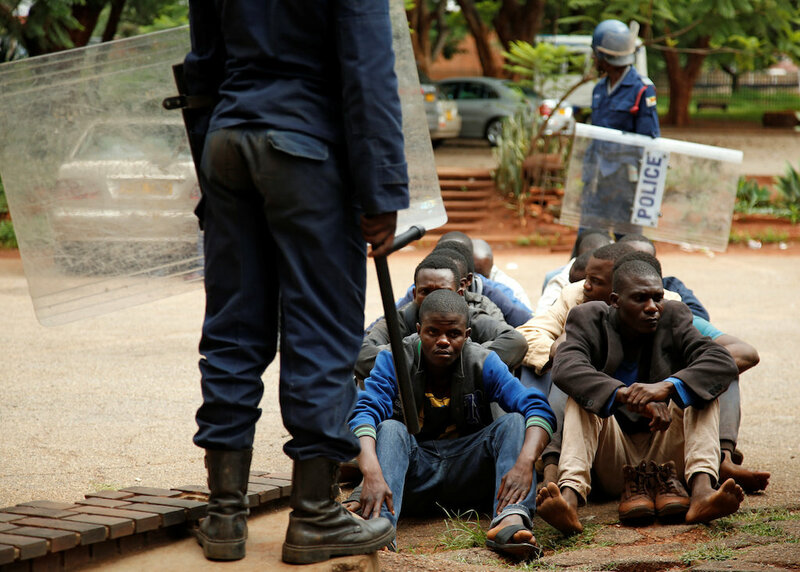 People arrested during protests wait to appear in the magistrate’s court in Harare, Zimbabwe. HARARE – The men wearing police and military uniforms came in the middle of night, forcing their way into the home where Brighton lives with his young family outside Harare. First, his wife was beaten, then they turned on him, kicking him and hitting him with sticks after dragging the couple — who have a one-month-old child — out of their bed. The attack was just one of dozens of testimonies depicting a brutal crackdown after protests erupted this week over the government’s decision to more than double petrol prices. “I was sleeping around 02:00 am and they were banging at the door,” Brighton said, as he waited in a Harare hospital for treatment for bruising on his face. “They first beat up my wife. When they realised that she was carrying a baby, they stopped and ordered her to come out to watch while they beat me. “I was the only man there. All the other tenants were out. They said ‘we will beat you on behalf of the other men absent’. “They told me to stoop and then they started beating me, kicking me,” he said, recalling the assault in the early hours of Thursday morning. “I don’t know why they beat me,” said Brighton, who is employed by an engineering company, adding he had been busy at work on Monday, the main day of the protests. Doctors’ groups say they have treated hundreds of casualties this week. For some critics, the repression echoes the grim brutality of Robert Mugabe’s era. The UN’s human rights office on Friday urged Harare to “stop the crackdown”. It voiced alarm over the security forces’ “excessive use of force,” which included reported use of live ammunition. “They broke a window to the spare bedroom where my children were sleeping, the kids started screaming and ran to our bedroom,” truck driver Rogers, 40, told AFP. “They said if we refused to open up, they would fire teargas. Another victim, Somandla — who is unemployed — spoke softly and was visibly in pain, with a cotton bud in his ear. “My ear got it worse as they used a gun to beat me there. It was hard for me to hear in the morning. Human Rights Watch accused the police of shooting people in broad daylight, while Amnesty criticised Zimbabwe to end its “repressive measures”. The crackdown has spread from Harare’s residential districts to provincial towns.